Greg French is best known as a master fly fisher, and he shares many of his wondrous fishing stories in his book Water Colour. But many readers may not realise that he has plenty of encounters with creatures much furrier, and bigger, than fish: bears. Greg shares here some incredible stories and photos from over the years. I’m a fly-fisher, and a lot of my writing deals with people who live and work with trout and salmon. I spend most of my time in Australia, New Zealand and Patagonia, but my work also leads me to native habitats in the northern hemisphere. Bear country. In 2006, for example, my wife Frances and I took our kids to British Columbia to see the spectacular Fraser River run of sockeye salmon, which literally turns the tributaries red. Our children Tom and Jane were young at the time, and nervous about potential bear encounters, so Tom’s best mate did a quick Google search and announced, with a roll of the eyes, that the total number of reported bear attacks in BC over the last few decades was ‘precisely five’. Then he did another search and announced that the total number of reported alien abductions was 250. And, despite this dose of perspective, we still ended up camping in backcountry cabins rather than tents. Some years later Frances and I went to Yellowstone National Park where there are no backcountry cabins, and the kids decided to stay at home. 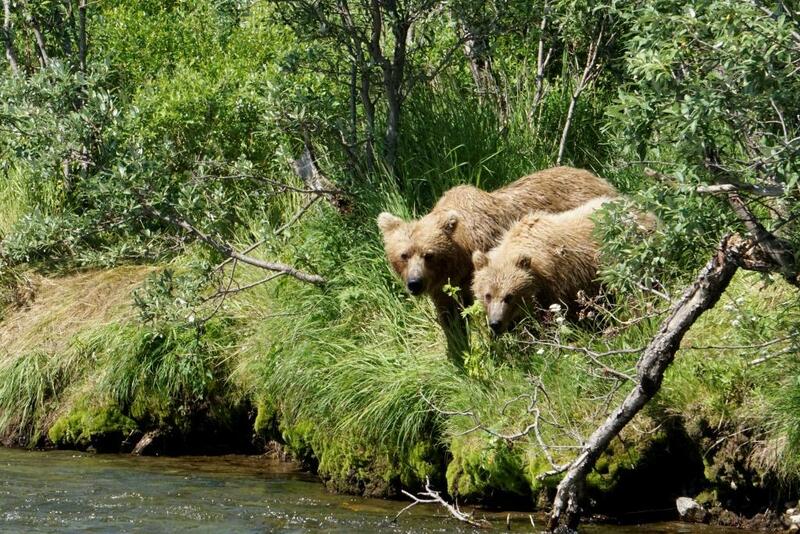 Perhaps they divined that a giant grizzly would take interest in a cutthroat trout we were photographing. 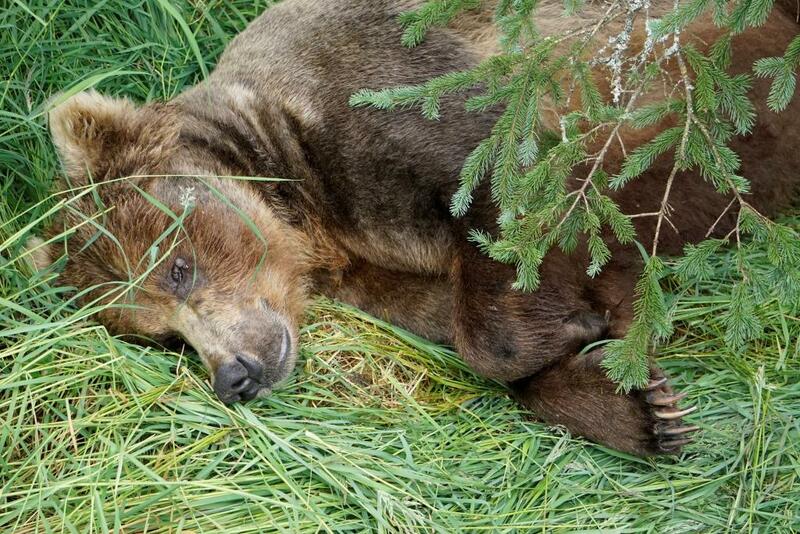 That the same grizzly would drag an elk carcass into camp in the black of night and begin prowling around our tent. That sometimes it would go away. That it would always return. Nose the tent. Sniff. Snort! The following northern summer, when I decided to see how an unprecedented drought in the high Sierras was affecting California’s native golden trout, Frances was forced to confide that she simply couldn’t countenance camping out in bear country anymore. We ended up going to Hokkaido instead, but it turned out that the Shiretoko Peninsula has the highest density of brown bears in the world. It seemed that wherever we went, bears of one sort or another somehow managed to sniff out our campsites. Ipiutaq in South Greenland. The Onon gol in Mongolia. Hell, not even the Pyrenees were safe. In the decade or so since we visited BC, sockeye numbers in North America have crashed. Fish farming, over-harvest and climate change have all been implicated, but whatever the cause the entire coastal ecosystem seems at risk of imminent collapse. 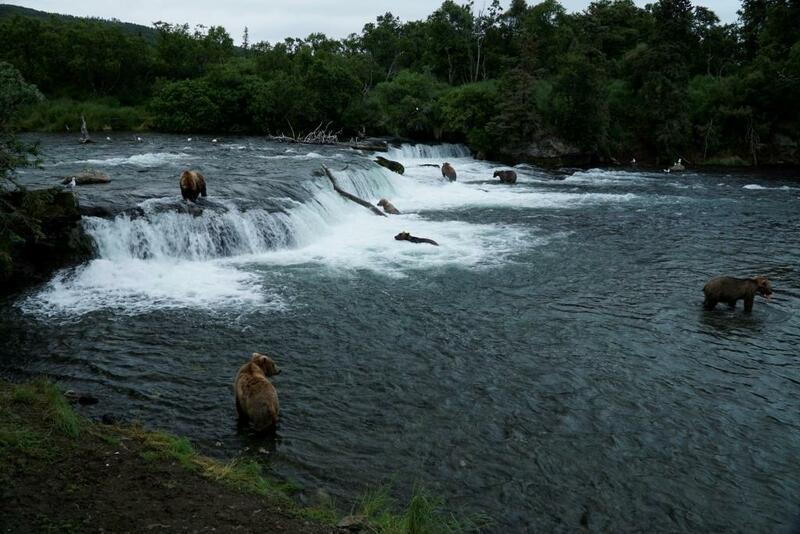 The most spectacular place we ended up visiting was Katmai National Park. 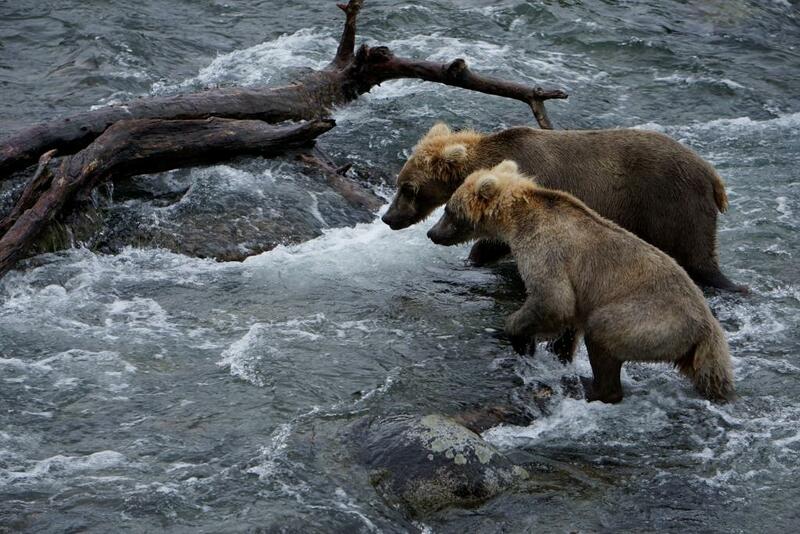 At Brooks Falls we watched up to twenty bears at a time fishing for leaping sockeyes. 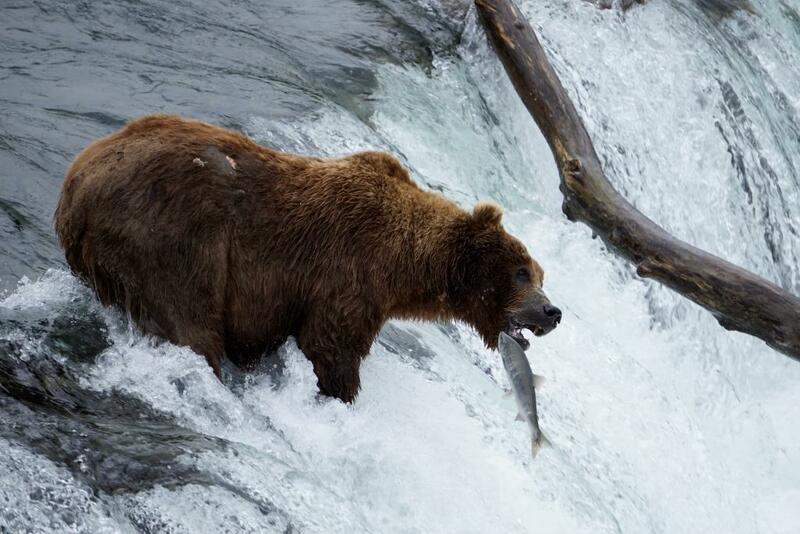 The most proficient was a thousand-pound bear who dominated a prime spot at the top of the falls and effortlessly snatched salmon after salmon from mid-air. But as spectacular as Brooks was, our most thrilling bear events occurred on fly-outs to intimate wilderness streams. Here, every encounter was unexpected, and often unnerving. If a bear decided to walk along the bank towards you while you were fishing, the best you could do was wade quietly to the other side. Once, we had a sow stop just twenty metres upstream of where we stood, and suddenly lunge off the bank into the current. Our guide carried a handgun in lieu of bear spray, which did nothing to put us at ease. But the bear calmly emerged with a giant chum salmon sideways in her mouth, clambered back up the bank, shook herself like a wet dog, and began sharing the fish with her cubs. 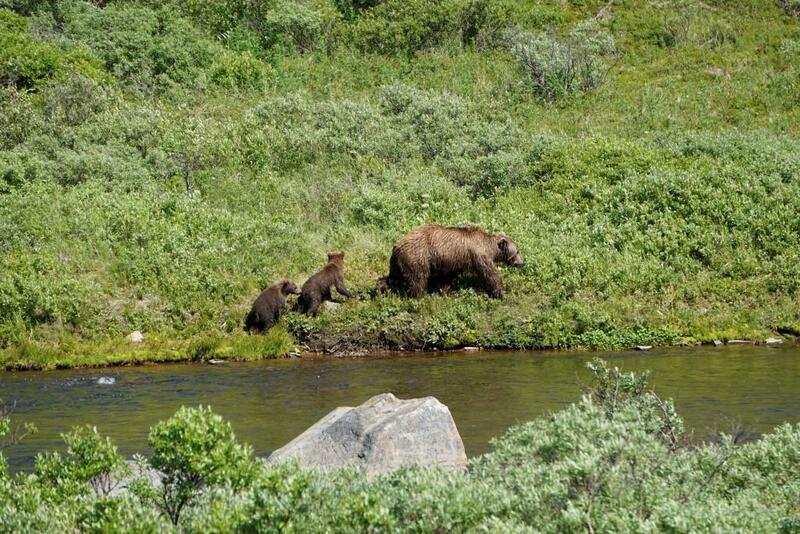 By the end of our Alaska trip Frances and I weren’t so scared of bears anymore: we were more scared for them. On the other hand, every Alaskan we met seemed desperate to do whatever it might take to protect the salmon runs, so there’s hope. All photos credit Greg French.